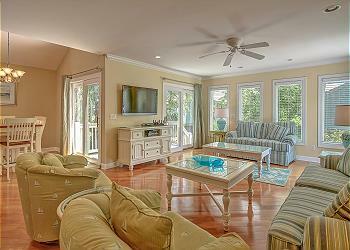 Lovely 4 bedroom, 3 bathroom home with private pool and spa located on Hilton Head Island! This house has an ideal location just steps away from the beach and across the street from Coligny Plaza with shopping, dining, and seasonal nightly live entertainment! Tastefully upgraded with new furnishings, appliances, granite countertops in the kitchen, and cool light-tiled flooring throughout. The first floor includes the master bedroom with king bedding, private bath, and access to the wrap around deck. The deck has a gas grill, outdoor seating for 6, pool, and spa. Upstairs hosts 3 bedrooms one with a queen size bed and private bath. The 2nd bedroom has two twin beds and the 3rd bedroom has 2 sets of twin bunks. Each of these has double door access to its private balcony. This house is near all the attractions and activities that have made North Forest Beach so special through the years! •	*Private heated pool (11 x 20) and spa (6 x 4) *This pool & spa have an electric heat pump. The pool & spa can be heated for an additional fee of $300 + tax per week. If you would like to heat the spa only, the cost per week is $225 + tax.